I love a sense of humor and a good pun, so naturally this week’s Vendor of the Week tickled my funny bone- Rancho Notso Grande. I’m seriously chuckling to myself as I type this. I’m also a little bit sugar-high right now too, and you’ll see why in the recipe section. That could account for the case of the chuckles, at least partially. 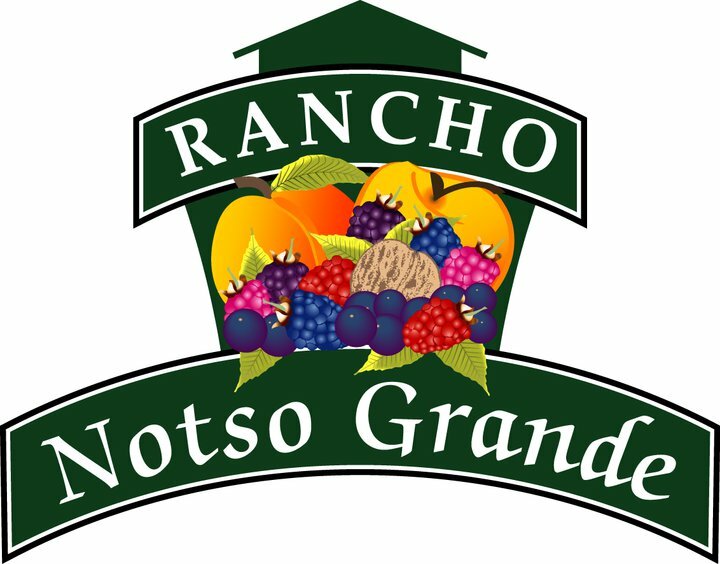 Rancho Notso Grande was founded as a commercial farm growing Walnuts, Peaches and Tall bearded Iris in 1997. In 2006 the farm diversified into direct sales with the creation of a You-Pick farm and road side stand and has evolved to participate in up to 9 famer’s markets a week. To promote healthy eating and to take advantage of the ‘anti oxidant craze’ we planted many different types of berries. Today we offer 13 varieties of berries, peaches, apricots, nectarines, apricots, walnuts, pecans and the ever popular Blueberry Wine. During the season the farm is visited by hundreds of people, a day, from all over the world who want to experience where their food comes from and enjoy highly nutritious foods that actually taste ‘Yummy’. Our bushes are never sprayed with pesticides, so you can eat the berries, for free, while you pick some to take home. A common story by our visitors is that, one of the fondest memories of their childhood is: “I remember that my Grandma had berry bushes down by the river. We would pick them and make a pie. It was the best thing ever!” Today, Parents and Grandparents want their children to have these very special memories too. Basically, everything about this makes me happy. No pesticides, perfect. Healthy eating- heck yes! Family, memories and sharing with loved ones? Well, that’s what it’s all about, isn’t it? And the berries are perfect. I bought a ton of blueberries and walnuts. I had no road map. I ate the walnuts. As I started working my way through the blueberries I realized I needed to do something that showcased the berries front and center without taking too many. So I made something up. They’re cookies. I made them up. Okay, someone else has probably made cookies like this before, but shut up. I made these ones up. They’re super good, which is good to know. When I was 6 or 7 I “made up” a cookie recipe that ended up in my sister chipping a tooth on the brick of a cookie I made with flour, sugar, water and a microwave for about 10 minutes. Thank goodness I’ve learned from my mistakes and I haven’t caused any dental panic since. In fact, these cookies are so good you’re going to probably eat them all in one sitting. All 42-48 of them. Don’t be ashamed, it’s okay. Seriously they’re that GOOD. Lavender Lemonade Cookies with a Blueberry on Top! 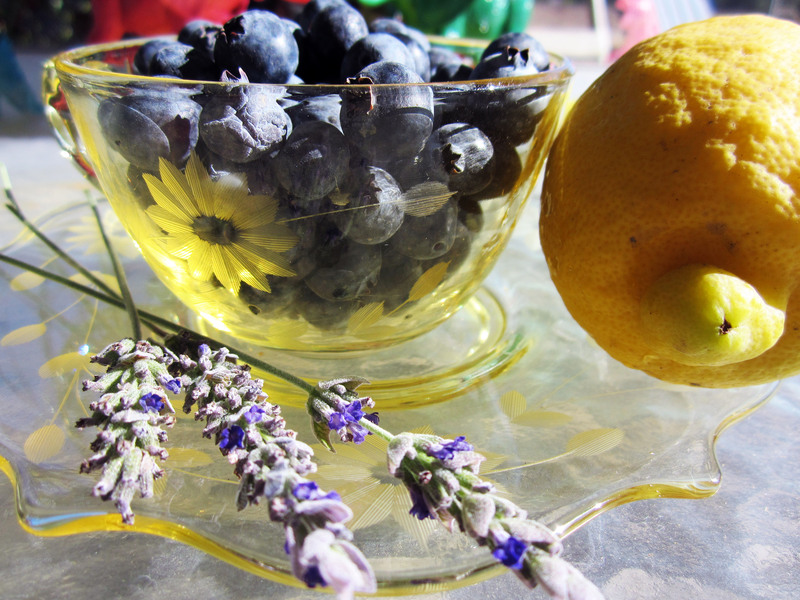 I used the lav and the lem from my own garden, but if they aren’t as plentiful (like when you try to make these off-season) dried lavender flowers and lemon juice are fine. First you’ll need to make your lavender simple syrup. It’s really easy, but really sticky. 1-3 tbsp lavender flowers depending on how much lavender you want. I used 1 because I didn’t want to feel like I was eating soap. It’s your call. In a small saucepan, boil water and lavender, add sugar and stir until sugar dissolves. Simmer for 5 minutes. Strain. Easy peasy. It should be fairly honey-like in consistency. 1 tub of earth balance buttery spread or I guess you *could* use butter too. 1 tub is 13 OZ. 1/4 cup almond milk or milk of your choice. Preheat your oven to 350°. Grab your baking sheet. You can use parchment paper, but I didn’t because I run out of things and never replace them. With an electric mixer cream sugar and butter. Add lavender simple syrup. Keep on mixing. Add lemon juice . Mix. Add vanilla. You got it, mix. Throw in that lemon zest. Mix. Slowly add flour and mix well. Now, here’s the best part. Take your chilled dough and get a rounded spoon-type device- a round measuring spoon would work, so would a smaller ice cream scoop ball up your glorified tablespoon worth of dough and press it into the scoop. Or just make a ball, whatever. Plop it on the sheet, stick a beautiful blueberry in the middle and smoosh the cookie down. You can use the bottom of a glass if you’re not into using your palm. Just smoosh gently, you want to maintain the structural integrity of the berry. Do this a lot until your sheet is full. I got 42 cookies out of this, and that’s with generous trips to my mouth… You could easily get 48 or more with smaller spoonfuls and less snacking on the dough. Pop it in the oven for 12-15 minutes until the corners are golden brown and lovely. Then consume voraciously. On June 26 the ‘Great Day’ crew from KMPH channel 26 will have a live remote from the farm between 5-10AM. Rancho Notso Grande are asking the community to come out and be on TV. For more information on this as well as what’s in season be sure to “Like” them on Facebook! Restaurant of the Week- Yogurt Etc. This sounds like great family fun.